GNSEF is a regional fair that includes much of the eastern portion of Nebraska, bounded on the east by the Missouri River and on the west by Clay county. Anyone in grades 6-12 attending school in this region is eligible to compete. Katie Bathke is a Senior at Allen Consolidated Schools. The title of her project is “The Development of Bacillus subtilis as a Environmental Competitor for Bacterial Leaf Streak" Her teacher is Marc Bathke. Daniel Stara is a Senior at Aquinas High School, David City. 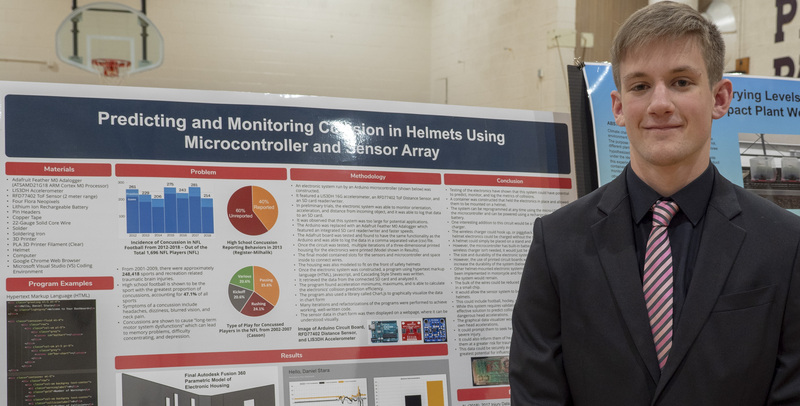 The title of his project is "Predicting and Monitoring Collision in Helmets Using Microcontroller and Sensor Array." His teacher is Roy Emory. Students do not need to enter another fair before coming to GNSEF– there are no prerequisites. Schools/teachers/home schools: in order to register students, you can use the student registration page. Anyone can create a login and then register one or more students. How to Claim Scholarship Funds Awarded at GNSEF – students, you can find the forms required to claim your scholarship funds on the awards page. The next GNSEF will be held March 23, 2019 in Nebraska City, at the Nebraska City High School. Early check-in scheduled for March 22, 2019. The awards ceremony is Sunday, March 24. GNSEF chooses two winners of all-expense paid trips to compete in the INTEL International Science and Engineering Fair each year. On this web site, you’ll find general information about the fair, a schedule, list of awards, and an online registration form and other information you’ll need to take your (or your student’s) project to the Science Fair. Registration begins January 1, 2019. The registration deadline is March 1, 2019.